Water Ingress into Load Area on a Kia Carens? Autodata’s Technical Team share their fixes to common problems raised through Autodata’s technical helpline, available to all UK customers. We are having a problem finding the source of water ingress on a 2013 Kia Carens. The right-hand side of the load area is wet after heavy rain. We have a general idea of where the water ingress is coming from but our attempts to stop it have failed so far. Can you help? The problem you have described has been reported by other technicians working on Kia Carens models built up to 15/08/13. The water ingress is through the tailgate weather seal due to excessive sealant on a bodywork joint. Inspect the bodywork joint in the affected area (Fig 1.1). Check for excessive sealant on the bodywork joint (Fig 1.2). 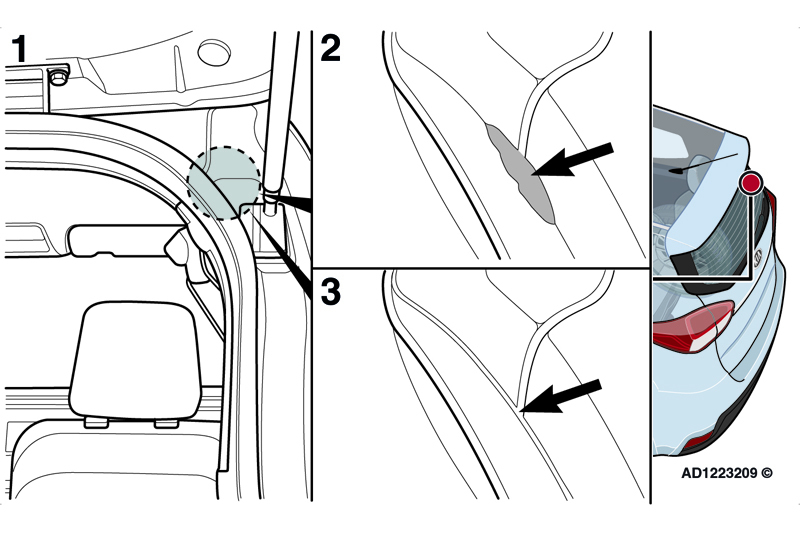 Remove excessive sealant from the bodywork joint to leave a smooth surface (Fig 1.3). Apply paint to the affected area to match the body colour. Fit a modified tailgate weather seal. Dry out vehicle as necessary. For further information from Autodata, click here.